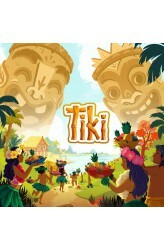 In Tiki, you are a divinity on Manami Island and you love all the delicious fruits that grow there. You prefer nothing more than influencing the living tribes of the island to share their gifts with you. Unfortunately, you aren't the only one. Another divinity shares your passion for these fruits, which leaves you only one choice — you need to show him your power in order to get more fruits than he does before the end of the fruit season. To set up, shuffle the nine village tiles and place them in a 3x3 square with some space between each tile. Players then take turns until the fruit supply exhausted or one of them collects four fruits. On a turn, a player creates a new totem (by placing one of their totem tokens on an empty village tile) or moves a totem that has one of their ..